So it's more than a little embarrassing to admit I had no idea that Excellent Education for Everyone (E3) - the big dog in education reforminess before B4K hit town - has a new President and CEO: Christy Davis Jackson. 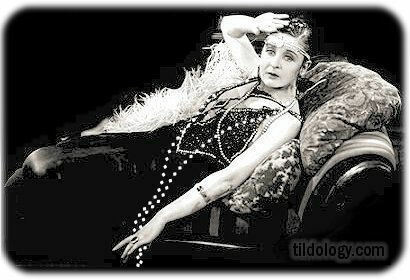 Some of you long-time NJ politicos are saying: "Wait a minute - the Christy Davis Jackson?" Excellent Education for Everyone (E3), which has been devoting itself to the passage of the Opportunity Scholarship Act, has just announced that it has a new President and CEO: Christy Davis Jackson, Esq. Ms. Davis Jackson will fill the shoes of the late Dan Gaby, E3’s much beloved chief executive. Ms. Davis Jackson served as Chief of Staff to Wynona Lipman (a former Essex County Senator), was Sen. Frank Lautenberg’s State Director, and managed Jon Corzine’s senatorial campaign. She is married to Reverend Reginald Jackson, who served on E3’s Board. Rev. Jackson has resigned to avoid any conflict with his wife’s new role. Ms. Davis Jackson said she views the CEO position at E3 as “… a unique opportunity to bring broad-based support to E3’s education reform proposals, including parental school choice, high academic standards, a revised and improved school funding formula, and proper treatment of teachers - - including tenure reform, performance based pay, and protection from political pressures.” She went on to say that she looked forward to the challenge of getting all stakeholders in New Jersey public education to focus on the needs of children as their first priority. Correction: E3's press release refers to “E3’s long time CEO, Dan Gaby.” In fact, Dan Gaby was E3’s Executive Director (see this tribute in PolitickerNJ). After Gaby’s death two years ago, Derrell Bradford succeeded him as E3’s Executive Director. Bradford is now Executive Director of B4K. This post is from the very reformy blogger Laura Waters, who also serves as the President of the Lawrence Township BOE. I Googled the you-know-what out of this story, and this is the ONLY report I could find about Jackson's appointment. Was this not released to the mainstream press? Did it only get sent out to reformy types like Waters? - She was right in the middle of the scandal at the University of Medicine and Dentistry of New Jersey; a scandal that helped Chris Christie build his corruption fighting creds back in 2005 before he ran for governor. - Her husband, Reverend Reginald Jackson, was at the center of a controversy when Corzine gave him $87,000 in donations; Jackson turned around and endorsed his failed gubernatorial reelection bid. - Hillary Clinton turned down Davis Jackson's money in 2008 when she ran in the presidential primary. - Reginald Jackson, as president of the Black Ministers council of NJ, has had a great influence on the education policies of New Jersey. I'm just stunned Davis Jackson's appointment has garnered so little attention. Voucher legislation is closer to passing than it has ever been; no group has pushed for this harder the E3. How does the group get a new CEO with a past like Christy Davis Jackson's with so little notice? 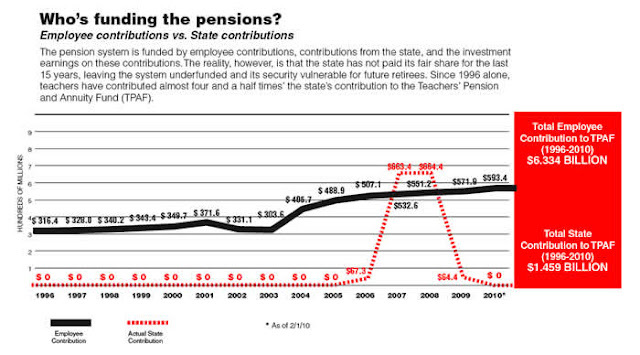 The state should be paying about $3.3 billion into the pension fund this year, but will kick in about $468 million. And in the budget for fiscal 2013, the state will only pay about $900 million of its $3 billion bill, records show. As part of a measure that passed in 2010, the state will increase its payments by one-seventh each year over the next seven years. Experts have compared this with a homeowner who takes out a mortgage and makes only partial payments for seven years. Then, after those seven years, the missed payments are added and the homeowner is saddled with a much bigger mortgage and higher monthly payments. So teachers, cops, firefighters, state workers - we're all paying more into the pension. Christie told us it was the only way to "save" it. But he's not meeting his responsibilities, so these extra payments are in further jeopardy. All so millionaires and corporations can get tax cuts. I've offered a deal before, and it still stands: I'll get out of the pension system right now. Give me all my money back, with interest. Then pay me the amount the state was supposed to kick in for the rest of my career. I'll take my own chances with investing it; I can't do any worse than Whitney Tilson. Of course, Chris Christie will never, ever take me up on this deal, because he needs my payments to meet current obligations and continue to give huge tax gifts to the wealthy. I and my fellow public workers are bailing him and his masters out, yet he says we are the problem. By 2018, state taxpayers will begin paying more than $5 billion a year for pensions, about 10 times higher than the payment being made in the budget for fiscal 2012, which ends on June 30, according to administration estimates. By 2018, President Christie will have either moved on to destroying the finances of the entire country, or he'll be lobbying for Wall Street. Either way, he'll be long gone, and someone else will be cleaning up this mess. It won't be pretty. May, 2010: The Attorney General of New Jersey, Paula Dow (a Christie appointee), praises Khan's Nehemiah Group for their program reintegrating ex-offenders back into the community. September, 2010: Khan signs a lease-purchase agreement with the Diocese of Camden for the former Holy Rosary Church complex in Cherry Hill. He moves Solid Rock Worship Center to the complex and opens a private school. October, 2010: Khan submits an application for the Regis Academy Charter School in Camden. The application is supported by the Black Ministers Council of New Jersey and its president, Rev. Reginald Jackson. October, 2010: The Voorhees, Cherry Hill, Lawnside, and Somerdale school districts are notified that am application for a charter school has been submitted to their districts. January, 2011: Regis Academy is not approved in the round released this month (although Jackson claims all five supported by the BMC were approved, in contradiction to earlier reports). March, 2011: The BMC holds a workshop during its annual conference for "churches that would like to start charter schools." Attending the conference that day are Gov. Chris Christie and ACTING Commissioner of Education Chris Cerf. April, 2010: Neighbors of Solid Rock in the Ashland section of Cherry Hill complain about a rash of burglaries connected to a man living at the center. May, 2011: The Cherry Hill School District and the other three districts are informed that a charter school application has been resubmitted to open in the town. Cherry Hill and Voorhees file responses stating the charter is unnecessary in the high-performing districts. May 2, 2011: Holy Eucharist Parish files a civil action against Solid Rock Worship Center for failing to make payments toward the $2.9 million lease-own agreement. UPDATED: Week of May 15, 2011 (approx. ): Amir Khan releases a video urging viewers to contact the NJ Assembly Education Committee and express disapproval of a bill that would require local approval of charter schools. Khan states on that coming Sunday he will ask his congregation to turn on their phones during services and contact state legislators. May 24, 2011: Khan appears behind Chris Christie at a town hall in Cherry Hill. June, 2011: Holy Eucharist and Solid Rock settle out of court "at the last minute." No indication is given in the report as to why Holy Eucharist settled the lawsuit. Sharp Principal Robert Homer said he was contacted Monday by Cherry Hill Superintendent Maureen Reusche about Christie’s visit. “Dr. Reusche had spoken with the Camden County Commissioner of Education, who was evidently impressed with how quickly the Cherry Hill district had moved forward with the CCS,” Homer said. Note the "Christie Administration" is credited, and not the NJDOE. Acting Education Commissioner Christopher Cerf said the four schools approved would help expand the option for New Jersey students, especially those in failing districts. He said the applications denied were all vetted using "disciplined" critieria. "The very first bar that a charter applicant must clear is that the school has a high likelihood of providing an excellent education," Cerf said. "We are confident that all of the schools we approve will be successful." For the first time, the state followed guidelines set by the National Association of Charter School Authorizers in deciding which applications to approve and deny, Cerf said. "I could sell a bikini to an Eskimo," Khan once boasted. About an hour into a session that had been cordial and laced with applause, Cherry Hill resident Alan Erlich interrupted Christie as the governor was answering a question about the school, Regis Academy. Emotions quickly escalated. But after Erlich charged the charter school’s approval was a favor for a Christie supporter, the governor denied the claim. There was only one problem with Christie's statement that he doesn't know Khan: Khan was sitting right behind him! - Why didn't anyone from the NJ DOE or the National Association of Charter School Authorizers think it was a conflict of interest for Regis Academy, whose "Lead Founder" is Amir Khan, to pay nearly half a million dollars in rent a year to Solid Rock Worship Center, whose pastor is Amir Khan? Isn't there potential for serious problems in the future arising from this conflict? - Why was Khan's application rejected in the first round but accepted in the second? What changed? Did he attend the BMC's 2011 conference? 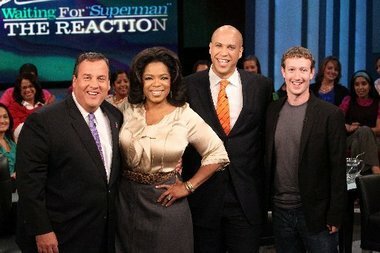 Did he meet with Gov.Christie or his staff at the event? - Is it acceptable to the Christie Administration that towns are forced to give money to charter schools when their lead founders admit their other endeavors are dependent on getting rent from that same charter? When Khan admitted his plan was to close his private school once the charter opened? - Why did the Catholic diocese suddenly settle out of court in June of 2011 with Solid Rock? Why didn't they just seize the property? What changed? - Did Khan meet with Christie or his staff in May of 2011 at the Cherry Hill town hall? - Khan made videos asking his parishioners to contact legislators to defeat a bill that would give towns control over charter approvals; I'm not sure when he published them, because they were removed soon after this story broke. When was he calling for this legislation to be defeated? During the application process? Who will demand the answers to these questions? And how many other charters that we don't know about have similar questions swirling around them? As a general rule, it's a bad idea to judge someone's intelligence based on grammar and spelling mistakes on a Facebook page. Or in the comments section of a website. People just don't treat those forums the same way they do formal writing situations like letters or essays. And they shouldn't treat them the same way; life's too short. In fact, I think making a big deal out of silly writing mistakes in comment sections says more about the intelligence of the person pointing out the errors than it does the error maker. Just calm down, OK? Time for another edition of "Spot The Pattern"! Can you find the pattern in these reformy stories? I can't embed the video (click the link to watch it), but protesters, shipped in by bus, are paid to demand a "failing" public school in the Windy City be closed. The protesters wind up being bussed back to a church center run by a pastor. As they disembark, the reporter asks several to name the school; they can't. 9th and 10th graders at Renaissance Charter High School made the following video as an assignment. They did such a good job that it received a mention in theNew York Times. I suppose this is an example of the innovative teaching that goes on in charter schools. Of course, it is easy for students to make something like this when the school has proper video equipment. As you watch the video, ask yourself what the students might have actually learned from this project. Yes, maybe they got experience being in front of a camera. They also probably got a taste for what it means to be behind the camera. Finally, they most likely used editing equipment to take all of their raw footage and weave it into a comprehensive piece. Public school children are perfectly capable of doing the same thing; all they need is the equipment. Of course, in the age of budget cuts that starve public schools, it is unlikely many of them would even have this equipment. The students did a good job on the video. It is not their fault that their teachers required them to shill for Governor Cuomo. While some teachers might be impressed with something like this, I do not see the educational value at all. The only thing the students of Renaissance Charter High School learned from this video is how propaganda works. This past week, pro-voucher forces in New Jersey bussed kids in from local Catholic schools to rally in support of a school voucher bill. Oops! Oh, is my face red! See, this is a quote from last year. He wasn't complaining about a pro-voucher rally where kids - many of whom did not know why they were there - were bussed in by adults. No, he was complaining about spontaneous high school student walk-outs in protest of his cutting nearly $1 billion from public education. Gosh, sorry to get that wrong. But I'm sure the Governor will be as equally dismissive of this rally as he was of the student walk-outs last year. He'll be out with a condemnation of this right away. 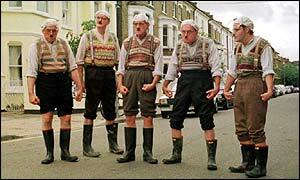 Any corporate reformer who tells you that reforminess is a "grass-roots effort" is full of beans. This is all a professionally staged, billionaire-funded, unaccountable assault on public education. And these people will use uniformed citizens and children as pawns without the slightest reservation if it gets them what they want. Here's the problem: Camden Street Elementary is not in Camden. As the Camden City Public Schools website shows, there isn't a school even remotely named Camden Street Elementary. (It took me all of 30 seconds to find this through Google, Tom). I happen to know that Camden Street Elementary is in Newark. Why? Because I wrote about how the school that was bad-mouthed by a child advocate group and the superintendent of Newark's schools, Cami Anderson. 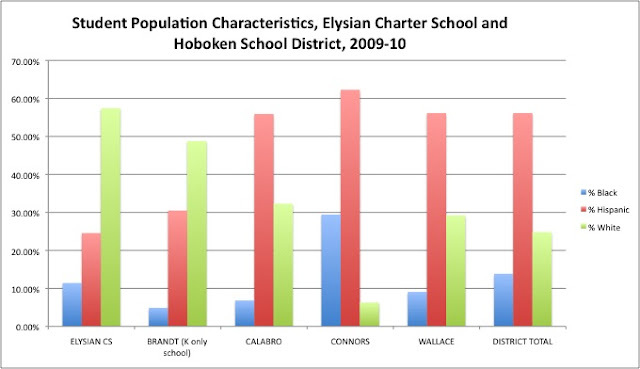 And then Bruce Baker shared some further graphs about Camden Street Elementary, which really got me angry about how the staff was being treated publicly. Branch Brook Elementary is the highest-performing elementary school in Newark; is it any wonder why Camden Street's wonderful and deserving children don't do as well as Branch Brook's in standardized tests? Camden [Street Elementary]'s special needs program houses approximately two hundred students. These students live throughout the City of Newark, and are transported to Camden by bus. Opportunities for integrating classified students into a least restrictive environment are accomplished through inclusion and mainstreaming. Our goal is to meet the various needs of all. To accomplish this task, we provide students with whole group and individual learning experiences. Tom Moran wrote that Camden Street Elementary was in Camden; it is in Newark. Tom Moran bemoaned the poor showing of Camden Street's third graders on standardized tests. Tom Moran showed no sign of knowing that Camden Street serves special needs students. This is lazy, indifferent, who-gives-a-s*** journalism that demeans the difficult work that both the educators in the City of Camden and the educators at Camden Street Elementary in Newark do every day. Moran owes them all an immediate correction. Yesterday, I responded to Laura Waters's piece at NJ Spotlight, where she described the fainting spells she gets when communities dare to stand up and demand that the State of New Jersey stop shoving unaccountable charter schools down their throats. Dear ACClark: I’ll take you up on your challenge to make a choice: since it’s doubtful that the fair solution of the money following the child will happen, we are happy to continue to do more with less at our charter school. At Elysian Charter School we will continue to educate our children for much less than the public schools (plus rent, no matter how reasonable, that the district doesn’t have to pay) and get better test scores and have a waiting list of 400 students. Look at those numbers above. Think about how many of the Hispanic kids speak Spanish at home. Look at the economic statistics. Think about how this may affect test scores. Charter schools have freedom, all right - the freedom to exclude the most difficult-to-teach students from their rosters. This, apparently, is Christie's great new vision for schools: economic segregation. Brandt is an early childhood center with kindergarten students, so it's a bit of an anomaly in the district. The other schools serve K-8 students, just like Elysian. There are clear differences in the populations, particularly with white and Hispanic students. 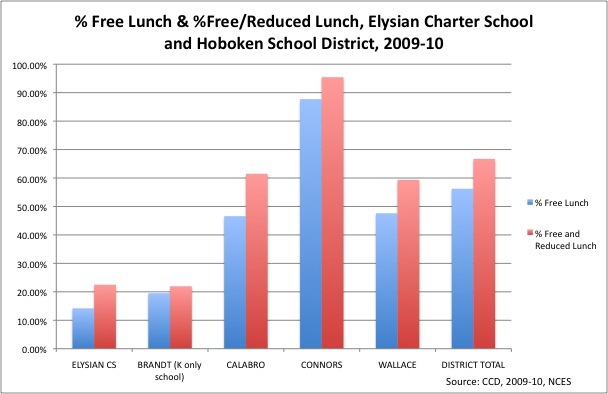 Bruce Baker tells us that "% Free Lunch" is the better metric, as it shows a deeper level of poverty, but both metrics show that Elysian has far fewer kids in need than the rest of the district. I'll say what I've said about other charters: Elysian is undoubtedly a fine school with a dedicated staff, committed parents, and wonderful, deserving children. I congratulate them on their successes. But let's not kid ourselves: what they are doing is not replicable. No matter the reason, the student population at Elysian is simply different from the population in the rest of the district. It is foolish and/or mendacious to pretend otherwise. Are we prepared to have an adult conversation about this or not? Well, fiddle-de-dee! Miss Laura Waters is so very upset by the nasty tone of those who object to having charter schools shoved down their throats; I'm afraid she's going to get the vapors! Perhaps the biggest rap against charters is that the local community must pay for them -- at least for tuition and transportation -- a fact that's trotted out at seemingly every opportunity by their opponents. In the fabric of New Jersey's public education system, the thread-count for charter schools is low. Yet their existence provokes the sort of red-faced rhetoric more suited to a Giants game than a discussion of educational options. It’s time for everyone to take a deep breath and think about what’s at stake. Oh, my heavens! How uncouth for these towns to stand up for themselves and demand accountability when it's their tax dollars that are being used to fund these unproven, unnecessary experiments in education! Example: in 2010 an aspiring charter called Princeton International Academy Charter School filed an application with the DOE to open a tiny Mandarin-immersion school that would draw from three districts: Princeton, West Windsor-Plainsboro, and South Brunswick. All affected boards of education weighed in and each gave a vigorous thumbs-down, a verdict as predictable as the tides. Former commissioner Lucille Davy approved the application. In response, the three districts mounted a public relations campaign to fight the opening of the school. Current costs for lawyers, zoning engineers, and other professionals are estimated at about $100,000, which came from school taxes. In response, PIACS has hired its own lobbyists and lawyers and is suing the Princeton Regional School Board for misuse of public funds. Judge Lisa James-Beavers just ruled in favor of Princeton; PIACS is appealing her decision to acting commissioner Chris Cerf, who will rule in February. Miss Laura, let me explain to you how democracy works: if the good people of Princeton decide that the money spent fighting this incursion into their schools is ill-spent, they will vote out the school board members who approved it. If, however, they decide the local charter school is not spending their money wisely, they will have no recourse. "But the parents can vote with their feet! The school will close if they don't attract enough students!" Yes, and the school will stay open if they can convince enough parents who want to isolate their kids from the rest of the community to stick with them. But the parents aren't the only ones with a vested interest - who speaks for the other citizens of the town? A school is not a business, Laura - it is a civic institution. Everyone in the community has a stake in it, not just the parents. If this community as a whole decides they are well-served by having a charter, so be it - but all of the stakeholders need to be at the table. New Jersey's charter law makes that impossible. Obviously, it’s worth a lot to these three wealthy towns to stymie establishment of the charter. Princeton’s already been burned by Princeton Charter School, which bills the district annually for about $5 million in tuition and entices the cream (of the cream, if you will) away from the already high-performing traditional district. So you admit the cream has been skimmed, and the children who are difficult and expensive to teach are left back at the public school. Thank you for making my point. Laura Waters is your BOE president. And she thinks it would be perfectly fine if the state came in and forced you to take a charter without you having any say in the matter. She thinks you should simply trust Trenton to approve any charter that drains your tax monies away from your community's schools. People of Lawrence, are you OK with that? You people are SO zealous in demanding a say in your town's schools! Mercy! ADDING MORE: Seriously, read the comments on Water's piece. Her entire argument is dismantled by the posters. It ain't pretty. We’ve talked about this since the financial meltdown. Now it’s time to do it: Unlink pay from performance. The evidence keeps growing that pay for performance is ineffective. It also may induce executives to take company-killing risks. There are other ways to motivate employees that yield better results at lower cost. 1. In a modern economy, where new challenges emerge constantly, it’s impossible to determine the tasks that will need to be done in the future precisely enough for variable pay for performance to work well. 2. People subject to variable pay for performance don’t passively accept the criteria. They spend a lot of time and energy trying to manipulate the criteria in their favor, helped by the fact that they often know the specifics of their work better than their superiors do. 3. Variable pay for performance often leads employees to focus exclusively on areas covered by the criteria and neglect other important tasks. This is known as the “multiple tasking” problem. 4. Variable pay for performance tends to crowd out intrinsic motivation and thus the joy of fulfilling work. Such motivation is of great importance to business, because it supports innovation and encourages beyond-the-ordinary contributions. The idea that people work only for money has been thrown overboard by leading scholars. Research has shown that human beings are not interested solely in material gain. They care for the well-being of other individuals and value recognition from coworkers. Many employees apply themselves because they find their work challenging and worthwhile. These nonmaterial motivations point to better ways to get results from the members of an organization. Hey, I'm all for merit pay if I get treated the same way as Jeff Immelt. What do you say, Merit Pay Fairy? 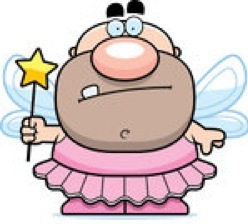 Dem CEOs is always askin' me to wave my wand! New Jersey is explicit in its regulations on charter schools. They cannot be operated by religious organizations, nor are they permitted to include religious instruction in the curriculum, the same as traditional public schools. Got that? A church cannot, by law, run a charter school. But a church leader can run one, and he or she can house it in their church. I'm going to once again drift way out of my area(s) of expertise, and ask a theological question: is it at all possible for a dedicated man of God - a man who has devoted his life to service of his Creator - to turn his faith on and off like a light switch? Is it reasonable to think someone who has taken on the special task of witnessing for his faith and serving his flock can simply leave all that at the door of his charter school? A bill to allow private and parochial schools to convert to public charters looked as if it was on the fast track to passage in the legislature last week. Then it wasn’t, for what may be a surprising reason. Sen. Raymond Lesniak (D-Union), the chief sponsor of the measure, said it was largely a technicality preventing the immediate vote. But he also acknowledged yesterday that he wasn't sure the bill would make it after all without the support of the one group it was meant to help most: Catholic schools. “Unless we can show a demonstrated need [from the Catholic schools], probably not," said Lesniak. 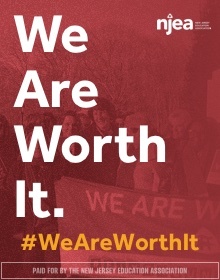 [George] Corwell, the longtime lobbyist for the Catholic schools, said he is neither for nor against the bill, but expressed a number of strong concerns and acknowledged that few, if any, parochial schools -- even those in peril of closing -- would seek to become charter schools instead. So the Catholics don't want to sponsor schools that don't offer a Catholic education. That makes sense; I can't imagine why any church, synagogue, mosque, or other religious community would want to sponsor a school that requires them to exclude their faith from the curriculum. Why does the Black Minister's Council have a different take? Pastor Khan, what do you say? Khan already operates an approximately 85-student private school on the property. Ah, I see. You are closing the private, religious school and opening a secular, charter school to keep your church going - all with taxpayer dollars from Cherry Hill and Voorhees, towns that never had a say in the matter. Pastor, how in the world did you manage to convince the Christie Administration to support this? Well, OK. I guess it wouldn't be that hard to sell a charter school that keeps your church afloat to a governor then, would it? ADDING: Darcie updates us on Tikun Olam, a "Hebrew immersion" school that also treads the think line between the scared and the profane. Reforminess knows no creed, does it? Rick Hess took the week off and left the keys to his blog with Neerav Kingsland, the chief strategy officer for New Schools for New Orleans. His posts this week - here, here, here, and here - are both astonishing and infuriating. In the following letter I aim to convince you of this: the single most important reform strategy you can undertake is to increase charter school quality and market share in your city--with the ultimate aim of turning your district into a charter school district. Dismissing this letter--and the idea of charter districts--would have been easier five years ago. But over the past five years, educators and policymakers in New Orleans created the nation's first charter school district. In a 2009 evaluation at Children’s Hospital in New Orleans, doctors said Lawrence could become “a productive member of society.” They said his fighting resulted from frustration at his difficulty in communicating, and recommended special- education services “at the highest level possible,” including speech therapy, tailored assignments and extended time on tests. Lawrence and some other students didn’t attend the ceremony to protect children’s safety,Benjamin Marcovitz, the school’s founder and principal, said in a phone interview. Angela De Paul, an Oprah Winfrey spokeswoman, declined to comment. This is aside from the equally relevant issue of the change in NOLA's demographics post-Katrina. We know that there is credible evidence that charters may be increasing racial segregation; put this all together with the potential for political favoritism and there is more than enough evidence to voice a real concern for Kingland's charter conversion plan. So what is Kingland's response? Surely he's thought about this? Surely, in his position, he's gathered data to address this all-important issue? So what does he say about charters and segregation? Nothing. Seriously - and I've read every post twice - he says nothing about charter schools segregating on the basis of race, creed, language, or disability. Instead, he cites India - India! - as a model for success. Hey, America, ready to put a caste system in place? And he comes up with a timetable to convert the Newark district into charters (sorry, but Eli Broad will have to sign off on that first, thank you very much). ADDING: It's worth saying yet again that this "reformer" judges the success of a school solely on its standardized test scores. Swell. 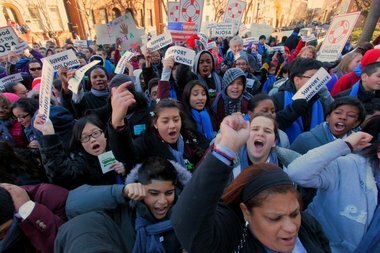 Charter Schools: Spreading the Hate? Are TFA Teachers Superior? No. "Pay Teachers More, But Until We Do..."
Son of Mario = Governor Goofus? Even More "One Study Does Not a Policy Make"
More "One Study Does Not a Policy Make"
REPOST: OK, Smart Guy - What Would YOU Do? Cuomo: I Love Kids More Than You Janitors Do! Cuomo: Governor Goofus or Gallant? Who Gets a "Superstar" Teacher?